The Kalash people, the tribe that inspired Kipling live their daily lives deep in the valleys of the Hindu Kush, the unforgiving mountain range at the border of Pakistan with Afghanistan. How they got there is a mystery. How they manage to survive is another. The Kalash are a people who have links with Greece in almost everything but proximity. They dance around night-time fires; they make wine and indulge in ancient Olympic sports such as wrestling and shot-put. With their piercing blue-green eyes, strong features and olive skins, even Alexander the Great was convinced of the Hellenic connection. Why, then, are they found tucked deep in the valleys of Brumboret, Rumbur and Birir then? Whatever the answer, the Kalash are one of the most remarkable cultures on the planet. With a population of just over 3,000, the largest minority group in Pakistan, they are an oasis of color and warmth in stark contrast to the seemingly inhospitable land that surrounds them. Despite their isolation, or perhaps because of it, the Kalash people are welcoming to Western visitors. There are two ways to enter the valleys: by foot or, landslides permitting, by road. Understandably, most people prefer the 90-minute jeep ride from the trading centre of Chitral, just 32 kilometres north-east. 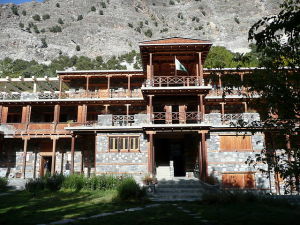 There’s not really any other reason to take the trip – everyone, including half the men of the valleys, it seems, are packed inside, and while most are returning from work in the Chitral souvenir shops, it’s entirely believable that some are just along for the ride. With just the right amount of speed, a liberal sprinkling of hair-pin bends and a conservative use of the brakes, you can imagine these ancient jeeps are propelled by sheer adrenaline. The valleys are idyllic and a haven from the hustle and bustle of Pakistan’s major cities and tourist attractions. Walnut and jujube trees cling to the lower slopes, while carefully cultivated sugarcane fields thrive along rivers at the bottom of each. It is here, deep within the Hindu Kush, that travelers come for a taste of another life, another time. Villages are little more than a scattering of wooden homes, and although there has been a recent blot on the Brumboret landscape in the form of a three-star hotel, most travellers prefer the simple charm of a 250-rupees-a-night ($10) guesthouse with twin rooms, meals on request and gardens at the rear. In the smaller valleys of Birir and Rumbur, it’s also possible to stay in family homes, and with comparatively few visitors there’s never a shortage of invitations, no matter how hot or sweaty you appear. But if the first thing that strikes you about the Kalash is their disarming hospitality, then the second is their appearance. 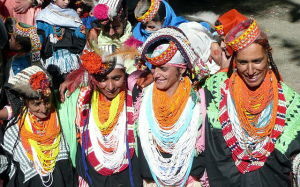 The word “Kalash” means “black” and refers to the clothing worn by the women and girls. It’s quite a misleading label, and while the men have definitely drawn the short straw in the clothing stakes, the elaborate garb of the women is anything but. Women tend to dress in very colorful and elaborate clothes in stark contrast with the rest of Pakistan. For the travelers who make the effort, this vibrant display is well worth it. Not everyone who makes the trip is so warmly received. Because the Kalash are pagans and worship a pantheon of gods including Dezao, the creator, or Jastak, the goddess of family, love, marriage and birth, rather than Muhammad, they are free from the restraints of Purdah. As such, they represent more than just an oddity for the Pakistani men who come to ogle the bare flesh. 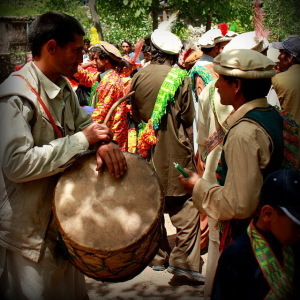 The Kalash have always been proud of their way of life and recently so is the rest of Pakistan. Traditionally the Kalash were ostracized by their majority neighbors and forced deep into the mountains for their religious beliefs, they have been tolerated through gritted teeth. It is only recently, once communications improved and the tourist interest soared, that the Pakistani authorities have tried to understand this wonderful culture.